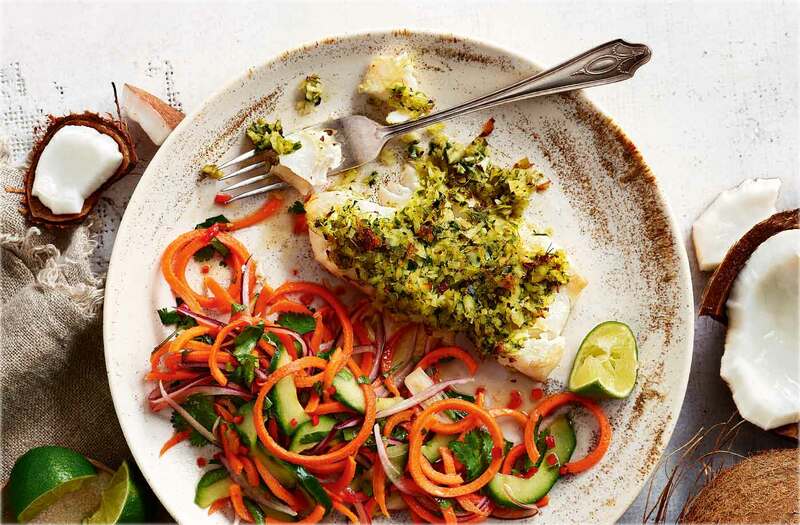 Delicate, flaky cod is the perfect base for this spicy, flavour-packed Thai dinner. The fresh coconut, chilli and ginger crust adds tons of tropical flavour, while the crisp carrot and cucumber salad makes a vibrant side. If using a whole coconut, preheat the oven to gas 6, 200°C, fan 180°C. Bake it for 15 mins to shrink the flesh from the shell. Remove, then carefully pierce the ‘eyes’ of the coconut with a corkscrew or skewer and drain the water into a glass. Tap the middle of the coconut with a hammer or put into a plastic bag and crack on a solid surface. Scoop out 100g flesh with a spoon. In a food processor, blitz the coconut flesh, green chilli, ginger, coriander, fish sauce, garlic, coconut oil and lime zest and juice to form a rough paste. Put the fish on a lined baking tray and spread the coconut paste over the top. Bake for 15–20 mins until golden on top and the fish is cooked. Meanwhile, make the dressing by mixing the red chilli, vinegar, sesame oil and fish sauce in a bowl. Add the carrot, cucumber, coriander and onion and toss in the dressing. Serve with the fish and the lime wedges to squeeze over. Tip: Baking the whole coconut makes it much easier to get the flesh out of the shell but doesn't affect the fresh, creamy flavour at all.